The Independent has Travel by numbers: Scotch whisky, Islay makes the list with the number 8. 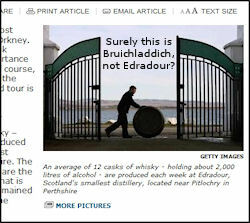 Eight as in eight working distilleries, leading to a mention of the Islay Festival. Islay should have also been mentioned in the subtitle of the picture, after all that looks suspiciously like Bruichladdich distillery and not Edradour. I'm also wondering if Kilchoman distillery should be in the running for the smallest distillery in Scotland, at least considering the capacity there shouldn't be much, if any, difference. The International Business Times writes about The Road to Whisky Island: A Scottish Adventure, the whisky island obviously being Islay. A nice account by Paul Edwards of the journey to Islay and visits of Laphroaig (mainly) and Ardbeg. Away from the whisky the Daily Record (and many others) bring the story how Martin Clunes tells of panic attack ordeal on Scottish diving trip. This was when Martin Clunes was filming a new TV show on Islay. It's no coincidence this is making the news just now, the programme will kick off on ITV this weekend. Last but not least the Daily Mail has a drambusting tour of Islay, Scotland's wondrous Whisky Isle. Dan Crane and his girlfriend Kate went whisky tasting, beach walking and Highland Cattle spotting. Dan also got ‘electrocuted’. That's probably enough excitement for a weekend.